If you are in the market for an extremely exclusive Siesta Key Community, Point Crisp is certainly a neighborhood that should be on your short list. The development sits on a small peninsula that extends into Little Sarasota Bay just south of the Stickney Point Bridge. There are only a few homes found in this neighborhood that can only be located if you are quick to spot the small sign posted at the entrance to the community. 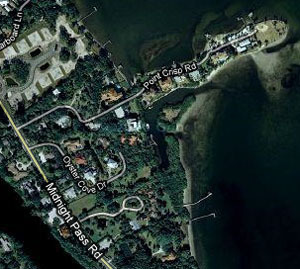 Point Crisp is a very historical part of Siesta Key and Sarasota’s literary history. This spit of land was named after a robber-barron named Crisp who was rumored to have won the land in a poker game. John D. MacDonald, A famous mystery writer built a house near the point that still remains to this day. In the parlor of John D’s home Ernest Hemingway once played chess with the mystery writer, and a slew of famous friends came and visited with John D while he resided at that residence. 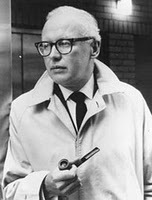 John D MacDonald was a brilliant writer who authored the Travis McGee series. He is attributed to writing 500 short stories and 78 books in his lifetime, many of them from his home on Point Crisp. Though most of the original homes on Point Crisp have been raised, the homes that have replaced them are noting short of stunning. Once you turn off Midnight Pass Road onto Point Crisp you will think you are in a dense jungle of lush tropical foliage inter-mixed with some huge tropical and native white oak trees. Home sizes range from 2000 square feet to more than 7000 and are priced between $600,000 and $6 million. Below are all of the current real estate listings available for sale in Point Crisp as of 6AM this morning.